Holaaa! This has been a bit of a long time no speak kinda thang because up until now I have been drowning in coursework and assignments, and have had absolutely no time to give to my precious little blog. I handed my final assignment in on Friday which means I have officially finished and survived my first year of Uni and I am now ready for lots of summer lovin' and frolicking! Although my makeup brush collection is still very much a work in progress, today I thought I'd share a little post about my four staple makeup brushes that I use daily. 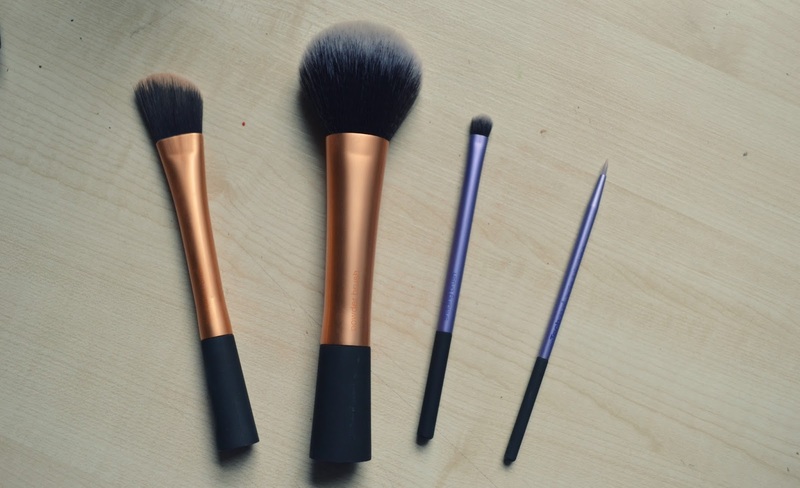 Decent, good quality makeup brushes can be pretty expensive, and if you want ones that are going to last and do their jobs correctly, then chances are you'll have to invest. 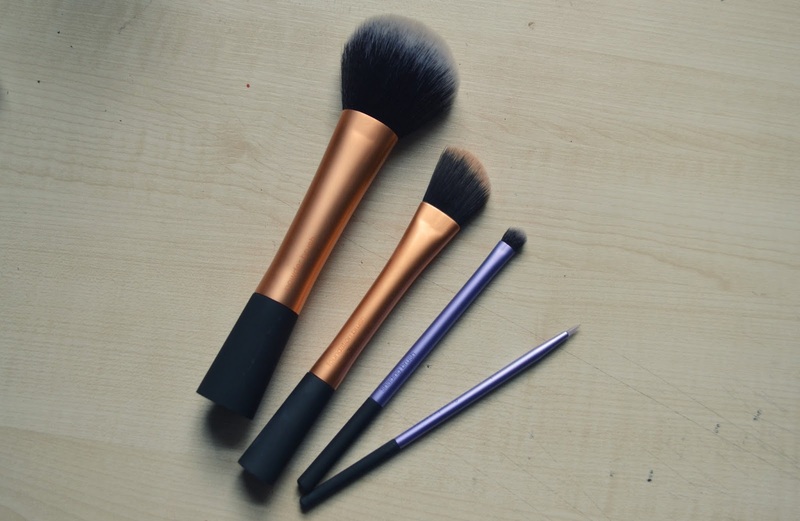 Using makeup brushes is not only far more hygienic for your skin, but brushes also help to blend product into your skin more evenly, achieving a more natural finish. If you're a student like myself, however, or don't have much cash to splash on expensive brushes, here are my four main reasonably priced brushes that I use and how I get the most out of them. My first staple makeup brush is a good old plain and simple Foundation Brush. I stepped up from using my finger tips and foam wedges to apply my foundation a couple of years ago now and have never looked back. 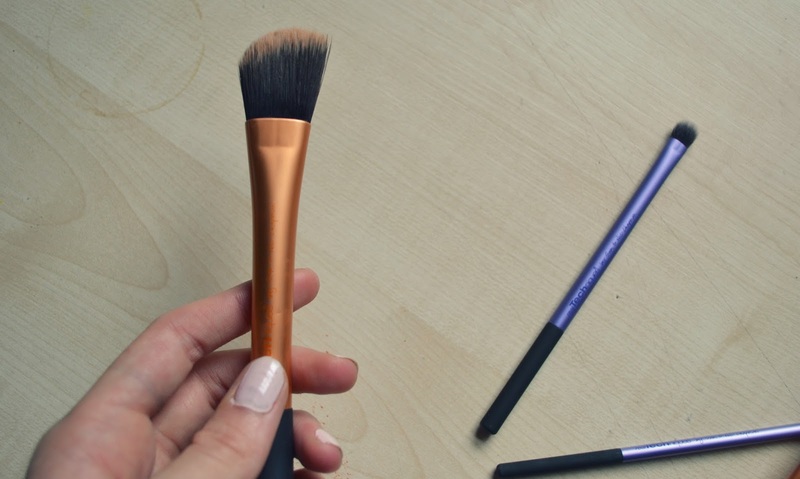 Using a foundation brush gives a much softer, natural finish and helps the liquid last longer on your skin. Using a foundation brush means you can be more precise about your application and apply more or less product evenly where you need it. 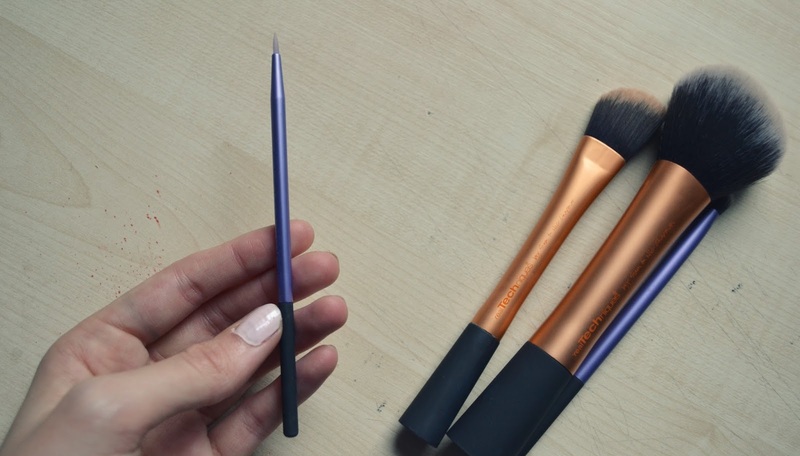 Using a foundation brush makes the whole base application process so much quicker and, with the angled shape of the brush, it's easy to reach typically difficult areas such as around the nose or eyelids. A big fluffy powder brush is one of, if not the most important and valued brush in my collection. For so long I used a small powder brush with harsh bristles and always ended up with patchy amounts of powder all over my face. 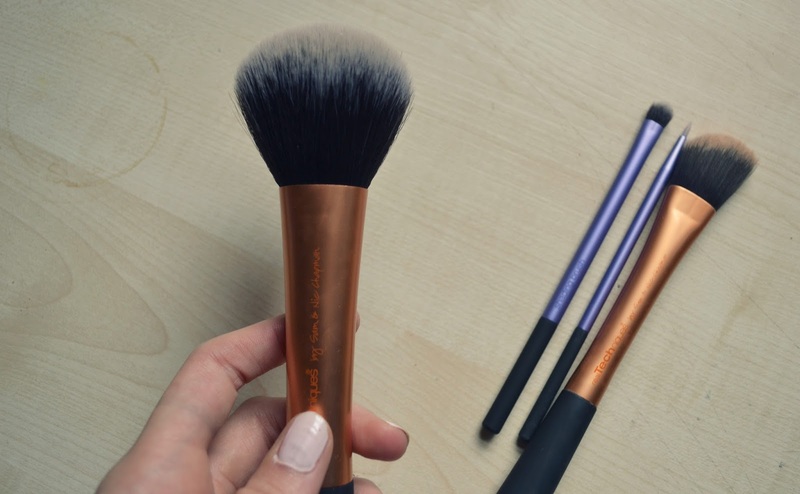 Having a decent powder brush makes such a difference - having a decent fluffy brush means you can dust your powder evenly over your face, covering areas of shine easily. Using a light, fluffy brush with natural hair bristles allows your skin to breathe but still provides good coverage. Another super duper important, and sometimes overlooked, staple makeup brush in my collection is a shading brush. 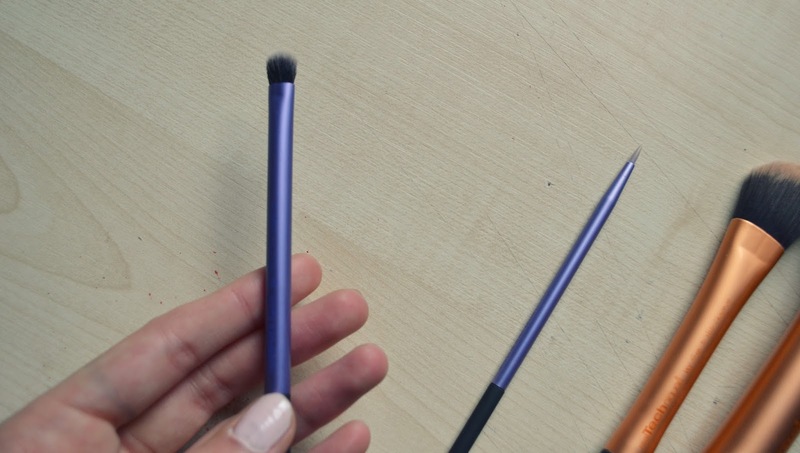 I use this brush simply to apply eyeshadow to my peepers, and to blend out different colours and shades on my eyelids. The small, soft bristles make it easy to blend into the corners of your eyes and the soft and light structure of the bristles mean they dust on shadows with no clumps or gathering powder. My final and perhaps most unusual staple makeup brush is a silicone liner brush. I find that most of the brushes that come with liquid eyeliners are often really thick and hard to use. For those of you who, like myself, prefer only a thin line of liquid liner on your eye, using a silicone liner brush gives you precise application. The thin brush only picks up a little bit of the liquid liner at a time meaning less smudges and thiner, more cleaner lines.The brush is also silicone meaning there are no bristles to pick up extra product, allowing a smooth application that doesn't tug your eyelid. These are not necessarily the only or best makeup brushes out there, they are just the ones I use and love. What are your staple makeup brushes? Good choices, and these are pretty affordable too. I love foundation applied with a brush rather than sponges as well. Make up brushes really confuse me. I only have a powder brush - don't need anything else :P I must be putting my make up on wrong haha! The liner brush in particular - I've never had a problem with the brushes that come with liquid eyeliner. Ok this is just what I needed! I've been looking to invest in a new brush for some time - I're been using the kabuki brushes that came with my Bare Minerals set like 5 years ago! I'll check out Real Techniques for sure. Thanks Amy! I could not live without my shading brush there is nothing worse than going away for the weekend only to discover I've missed packing my brush in my make up bag, using my fingertip just does not cut it. Never occurred to me to use a brush to apply foundation using a brush. What a great post, Amy! I seriously need a foundation brush but wasn't sure which one to get, so I will definitely have to go and try one from Real Techniques! !